"High-index" refers to the index of refraction of a lens material, which is a measure of how efficiently the material bends (refracts) light to provide a corrective effect. Lenses made with a high-index material require less mass to correct your vision and therefore are noticeably thinner than standard glass or plastic lenses of the same power. Polycarbonate lenses are up to 10 times more impact resistant and 20 to 25 percent thinner than regular plastic lenses. They also are up to 30 percent lighter than regular plastic lenses. nose. Trivex lenses provide comparable impact resistance, thickness and weight as polycarbonate lenses, and, like polycarbonate lenses, they block 100 percent of the sun’s harmful ultraviolet (UV) rays — protection that may reduce your risk of developing cataracts or macular degeneration later in life. Anti-reflective (AR) coating eliminates lens reflections and allows more light to enter the eye for better night vision. AR coating also reduces reflective glare and improves visual comfort for tasks like working at a computer. No eyeglass lenses — not even glass lenses — are scratchproof. 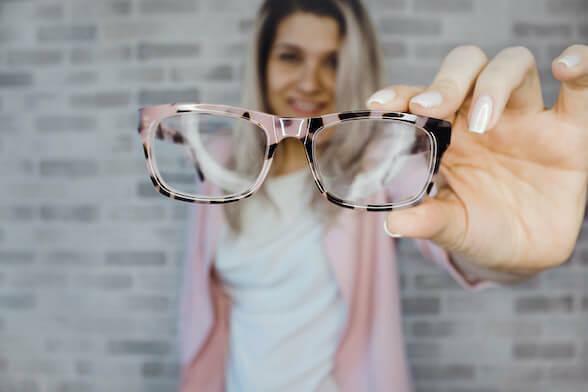 But applying a clear, scratch-resistant coating to both sides of eyeglass lenses greatly increases the hardness and durability of the lenses. Scratch-resistant coatings are essential for all lightweight high-index lenses, which have a relatively soft surface and are easily scratched without added protection. Most high-index lenses have 100 percent UV protection built-in. But with regular plastic lenses, a special lens treatment is required to provide complete UV protection. This UV treatment does not change the appearance of the lenses and is inexpensive. Photochromic lenses darken automatically when exposed to sunlight, and quickly return to a clear state indoors, making them extremely convenient for anyone who doesn't want to worry about keeping prescription sunglasses handy for every trip outdoors. Photochromic lenses also block 100 percent of the sun's UV rays and are available in a wide variety of lens materials and designs, including bifocal and progressive lenses. For more information on choosing eyeglass lenses please visit AllAboutVision.com. Article ©2018 AAV Media LLC. All rights reserved. Reproduction other than for one-time personal use is strictly prohibited.